This recipe is courtesy of Pairings, a multi-award winning, food-themed, serialized fictional comedy series. About The Show: Alan is terrible with women. While Alan can cook beautiful (and delicious) plates of food, he often eats them alone. His friends and family convince him that ‘the way to a woman’s heart is through her stomach.’ As Alan starts cooking his way through the dating world, he discovers things about women, himself, and the lasting memories of food. 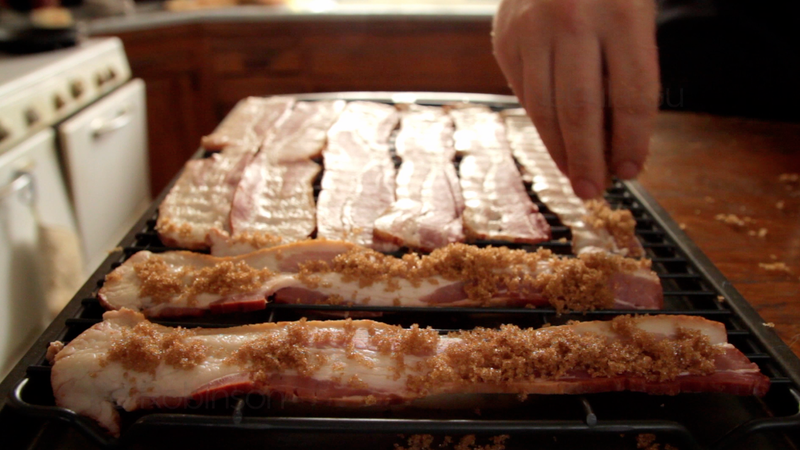 On a wire rack set over a baking sheet, lay out the bacon in a single layer. Sprinkle brown sugar evenly over the bacon. Place the bacon in a cold oven. Turn the oven to 400 degrees and cook for 20 minutes. Eat bacon with your eggs. Alan makes up with Drew and attempts to make up with Bobert. Rose confronts her ex-fiance, Roy. Steve and Alan deal with medical news. Candied bacon is made.